Monte San Salvatore is the distinctive 'hump-shaped' mountain across the lake from Lugano - it has been compared with table mountain in Rio de Janeiro, but then some people will say anything. It is beautiful though, especially on a Sunny day when the vibrant greenery contrasts with the shimmering lake. This walk climbs to the top of Monte San Salvatore, providing panoramic views in all directions, although the funicular can whisk you up with much less effort, should you wish. From here, the well-marked path leads downhill through the forest and along the peninsula, to finish at the picturesque village of Morcote on the Southern tip. As well as Italian food and scenery, this area provides Mediterranean weather - hot Sun and palm trees seem a very long way from Zurich, especially when the Spring flowers are blooming in Lugano while the North side of the mountains is covered in cloud. Lugano is more of a weekend destination than a day trip from Zurich, but can easily be reached with a direct 3-hour train journey through the Gotthard tunnel (CHF 54 return). 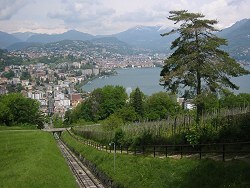 There are occasionally special Railaway offers including the train to Lugano, and more frequently "Click and Rail" offers to buy single tickets for CHF12 (only valid for certain train times). The funicular up to Monte San Salvatore starts from Paradiso, a short and pleasant walk along the lakeside from Lugano centre. This whisks you up in about 15 minutes (CHF 7 with halb-tax). From the end of the walk at Morcote, there are regular boats back across the lake to Lugano, or buses running a little later. For a zoomable, scrollable map of this hike, see this online map using Openstreetmap or Opencyclemap. You can also download this kmz file san_salvatore.kmz to open it in Google Earth or view it in Google Maps in your browser. Or of course you can use programs like Prune to transfer the track to your GPS. From the train station in Lugano, you first need to make your way down to the lakeshore. Ignore the novelty cable train and just follow your nose down the winding streets. Then turn right and enjoy the stroll along the tree-lined walkways towards the unmissable peak ahead. Around the Hotel Eden in Paradiso, branch off to the right and head towards the visible funicular tracks. You'll shortly see signs for the lower funicular station, where trains leave roughly on the half-hour. If you want to enjoy the views on the way up at a more leisurely pace, you can walk up, following the signs for "Parco Panoramico" from near the funicular station. Shortly the yellow signposts appear, and lead you off the road and onto a path climbing up through the trees. At around 370m the footpath leaves the fitness trail and cuts up to the right to meet the funicular tracks, which it follows up to the intermediate station at "Pazallo". The path then continues round to the left, climbing up past a 'Belvedere' lookout point to reach the summit after around 2h from the funicular base. Once at the top of Monte San Salvatore, a trip to the "Terrazza Panoramico" atop the small church at the very top is a must - the views are quite stunning. 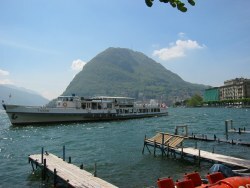 The Mote Rosa massif, containing the highest point in Switzerland, is clearly visible, along with numerous other snow-capped peaks, and the beautiful lake Lugano is laid out below your feet. Work your way back down to the funicular station, from where the path is clearly signed to Morcote, leading fairly steeply down the left side of the ridge. Some care is required on the steeper sections, with some rockiness and rootiness. The path descends a fair way before emerging from the trees at Ciona, a small Italian-style village with pleasant restaurant terraces and narrow twisting roads. From here the path gets easier and more level, as it continues to Carona. Watch out for the brief glimpses of lizards on either side of the path - usually just a rapid rustle and a flash of brown/green! 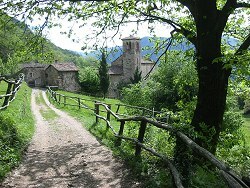 Just outside Carona by another restaurant, the path splits giving two options to Morcote. 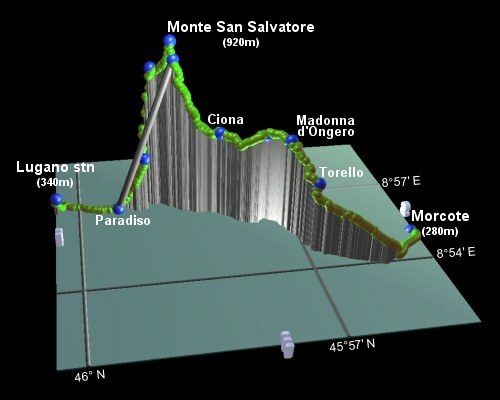 Take the right-hand one to sweep round the Western side of the ridge, signposted for Madonna d'Ongero and Torello. 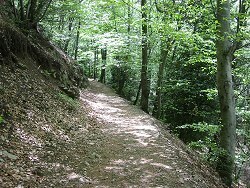 When the path forks again, again take the right-hand option, marked as the most direct route to Morcote. There's a distinctly Italian flavour to the buildings here, as you head round to overlook the lake on the Western side of the peninsula. Continue following the signs to Morcote, as the trail drops down to the outskirts of the village, eventually emerging onto paved roads lined with elaborate and colourful gardens. The main road along the lakeshore is beautifully situated, but unfortunately choked with traffic - the boat station is around 1500m along this road and the bus station is just opposite. Also directly here are a selection of restaurants overlooking the lake, and a variety of tourist shops. Morcote itself is more than just the road along the shore, and is worth a wander around if there is still some strength in the legs. Some villages are built out of wood, some out of stone, but Morcote is seemingly built entirely out of steps - exploring the tangle of passageways and stairways provides an amusing and scenic (if strenuous) diversion. The church perched up above the town is particularly worth a visit for its vantage point and its tangling paths. The following are the coordinates for waypoints along this route, obtained from GPS. They can be used either in another GPS, or along with a map, to provide additional references if necessary. 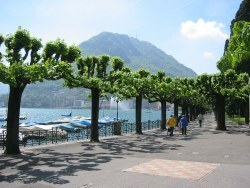 There's information about Lugano at lugano.ch, and about Monte San Salvatore at (you guessed it) montesansalvatore.ch. And don't forget to pick up maps, timetables and recommendations from the excellent tourist office in the centre of Lugano. Until mid-June 2004, there's an outdoor exhibition of sculpture throughout the public areas of Lugano by Arnaldo Pomodoro, with several interesting pieces in various forms. There's more information at the Museum of Modern Art site. Page last updated May 2004. Feedback welcome at mail@activityworkshop.net.